Ingenious unit designed to create horizontal and vertical storage compartments for your desktop. A base unit is supplied complete with 8 upright dividers which can be placed at the users’ discretion (at intervals of 2.5cm or more). This unit is ideal for storing narrow documents and papers (avoiding damage through bending) and keeping them easily at hand. Also ideal for A4 or Foolscap Suspension files. Both units come complete with optional adapters for the use of suspension files. No tools required for assembly. Manufactured from durable injection molded polystyrene. Simple assembly. Modular design means you can adapt Styrorac to your own needs. 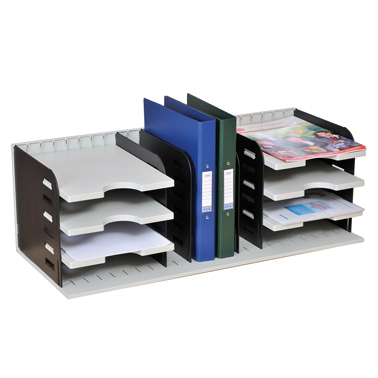 Position or change shelves or suspension files to suit your needs.